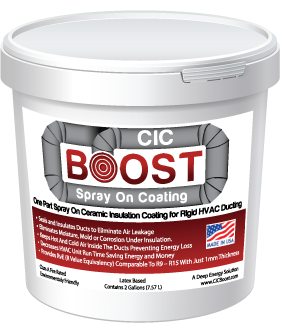 This application of CIC Boost increased the energy efficiency of the ducting and qualified for a rebate under SCE Solution AC-40390 within the Customized Solutions program. The CIC Boost extended the useful life of the ducting by twenty years eliminating the need for the city to replace the ducting. Radiation causes heat from the sun to warm the surface of the ducting. Conduction is the movement of heat from hot side toward the cold side through the walls of the ducting which causes air in the duct to warm up on a hot day. Convection within the duct circulates the air within the duct. The loss of cold air is shown in the diagram to the left. After the coating was applied the surface temperature of the ducting was reduced up to 69°F combined with the continuous membrane eliminated the loss of cold air. The duct sealant at the joints has failed and there is rust under the sealant that indicates condensation. Deep Energy Solutions power washed the ducts with a vinegar solution to remove the loose material. 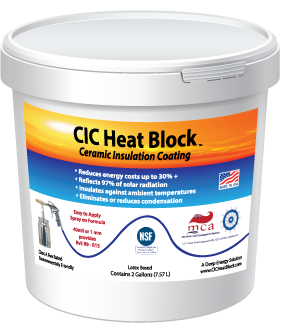 The application of CIC Boost provided a continuous membrane that sealed the joints along with the entire duct. An average duct has R-5 insulation inside the duct. 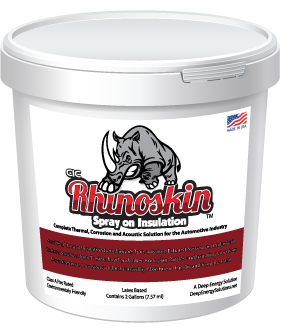 This traditional type of insulation has been proven to fail with the moisture of condensation and presents a potential area of mold and mildew with in the duct and contributes to corrosion under insulation. These graphs demonstrate that the coating reduced the surface temperature of the ducting up to 25°F and reduced the heat loss within the ducting by up to 4°F. Additionally, there is a motion sensor that shows that the HVAC unit is cycling on and off after the coating was installed where before the coating was installed the unit came on in the morning and ran all day. ASHRAE cited that for each 1°F the thermostat was raised provided a 3-6% savings in electric cost. The library is not changing the thermostat setting but by greatly reducing heat loading on the ducting the HVAC system runs less to provide the same amount of cooling thus lowering electric costs. We are predicting that a 4°F reduction in temperature will reduce the use of energy by up to 24%. The following images were taken before and after coating at the south end of the ducting where the AC enters the building, this temperature reading is at the joint. These images are of the also at the south end of the ducting in the shade of the roof overhang. FLIR images are measuring the ducting. The measurement taken before the coating was applied is lower because cold air was conducting out of the duct. These images were taken on the side of the long ducting run. This measurement was taken on the duct joint, showing temperature of the joint. Click on the image below to view a short video of the application.